I loved Get Smart. The hit TV comedy of the 1960’s chronicled the high jinks of inept spy Maxwell Smart. The iconic image of Smart talking into a telephone hidden in his shoe is etched into my memory from summer vacation reruns. 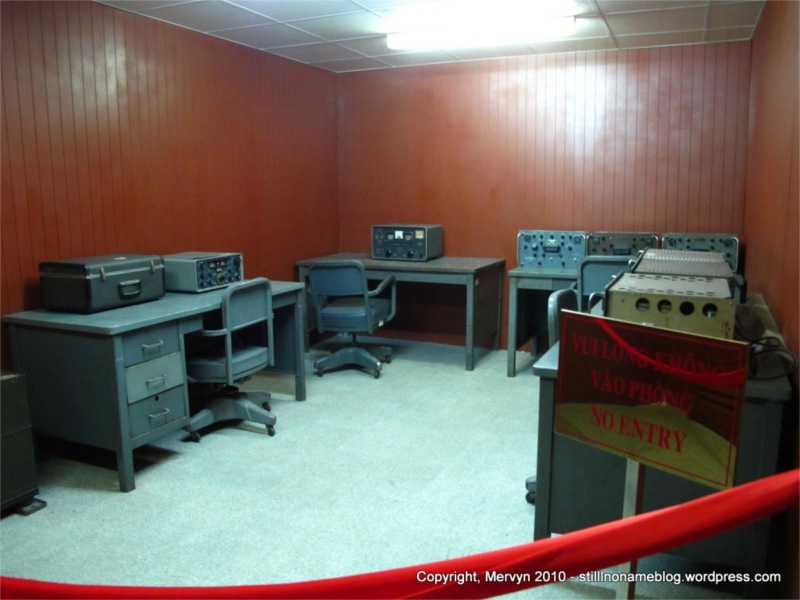 Smart’s spy base was hidden deep underground. 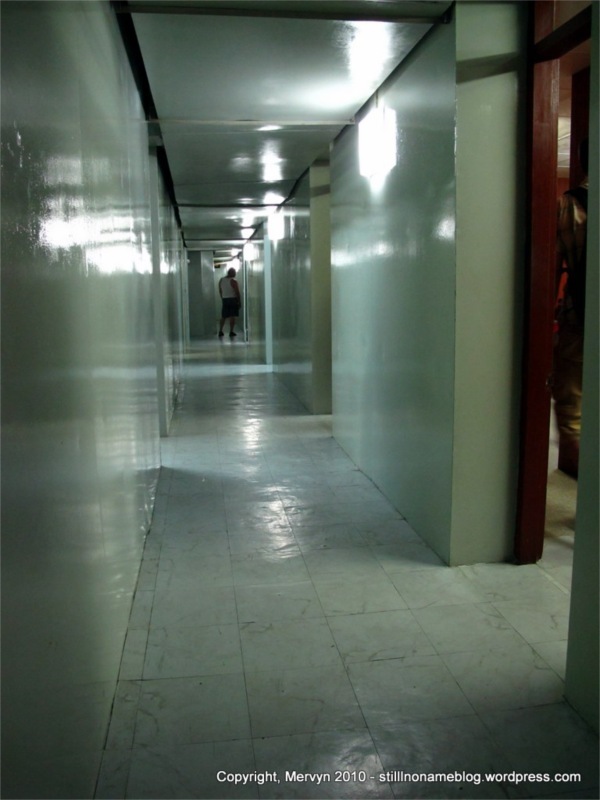 A labyrinth of long, bare, metal walled hallways led between anonymous offices and radio rooms. Operatives huddled over transistor radios, spinning dials and adjusting frequencies trying to clear the signal coming in through their oversized headphones. Chief occupied a sparse office where he’d direct operations. Then there was 99, Smart’s fetching partner. She balanced Smart’s stupidity with intelligence and killer looks. Her fitted outfits broke up the monotony of the ascetic maze of underground tunnels. 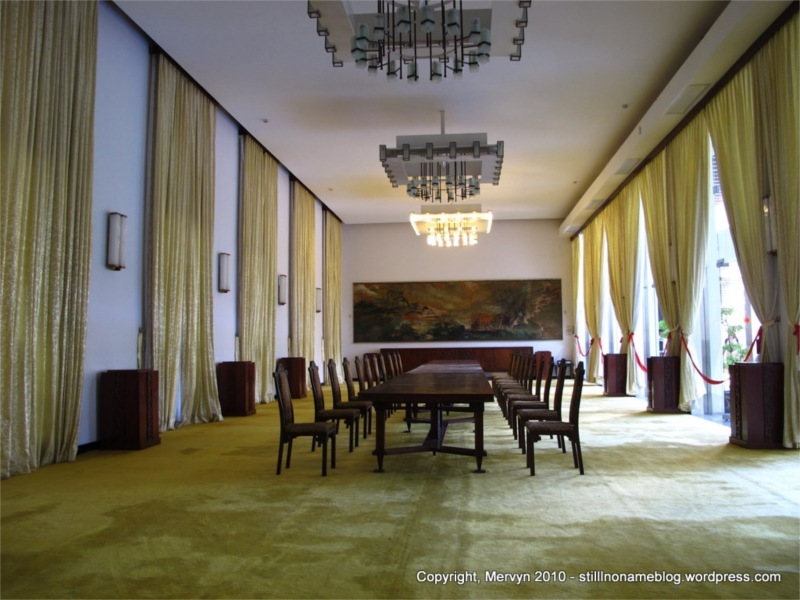 In the basement of the Independence Palace I got a glimpse of the world that inspired the show. 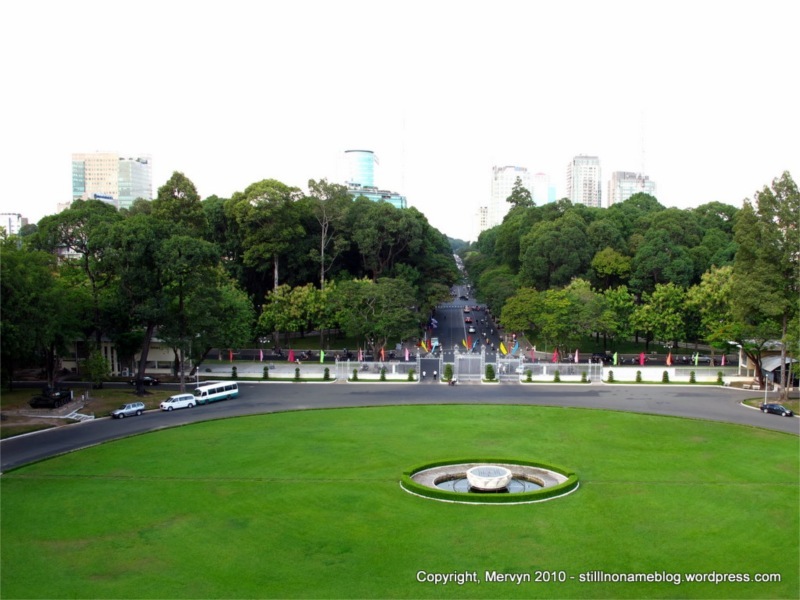 The Palace, which Lonely Planet refers to as the “Reunification Palace,” is in the center of Hi Chi Minh City. 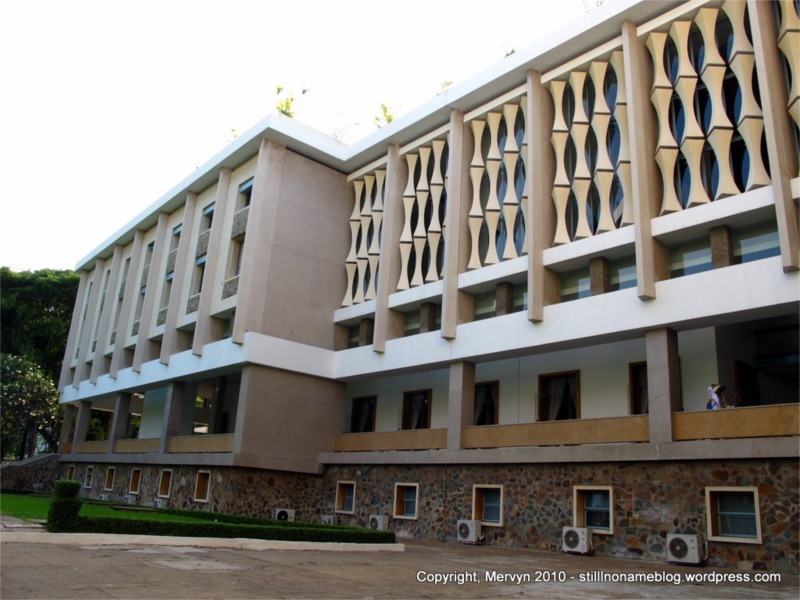 Formerly the residence of the president, it was essentially the White House of South Vietnam. 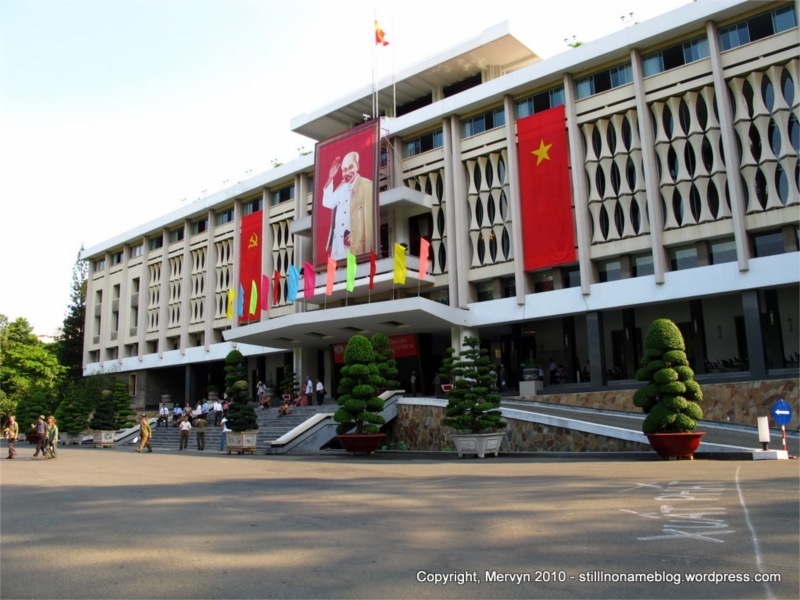 The administration directed the South Vietnamese forces from bunkers beneath the palace. 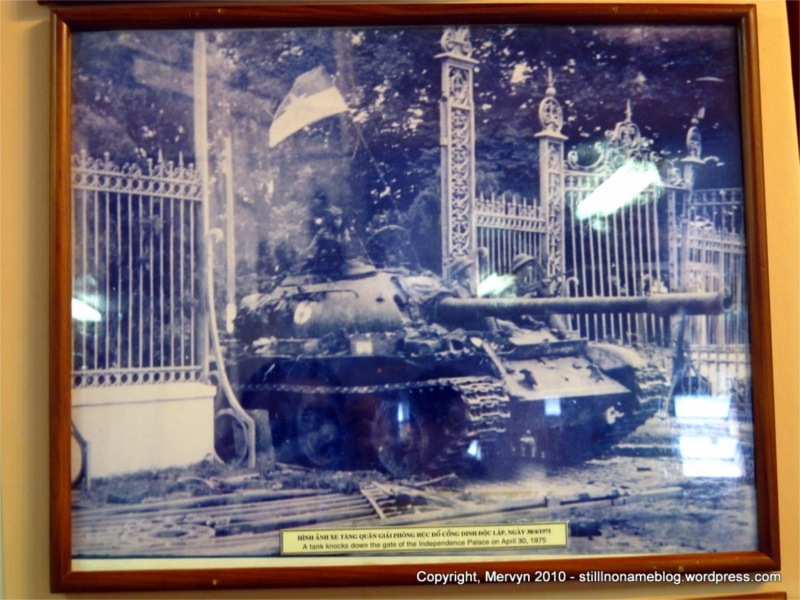 The north gate is the site of one of the iconic images of the Vietnam-American War—a tank breaking through the palace gate, the final signal of the fall of Saigon. 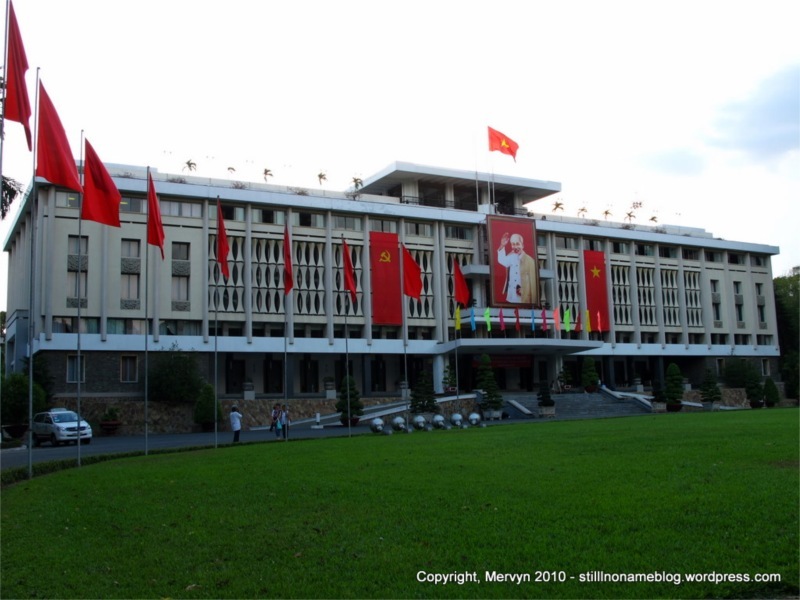 Other than the repaired gate and a couple cosmetic changes (communist flags and regalia, including a giant picture of Ho Chi Minh) the palace hasn’t changed much since the end of the war. Right away you can see that the façade of the palace is dated. The building is a giant box with features that attempt to break up the monotony. It ends up looking like a half-hearted attempt at a giant wedding cake. Scooped pillars sit in front of glass windows. These “modern” features sit atop a cobblestone base. It actually looks a lot like some of the buildings at the CIA headquarters in Langley, Virginia. That is not really a compliment. Even the topiary feels throwback. The plants have been carved into circles and rounded pancakes, as if to try to counterbalance all the right angles on the building. Inside, the first and second floors have a series of formal receiving rooms. 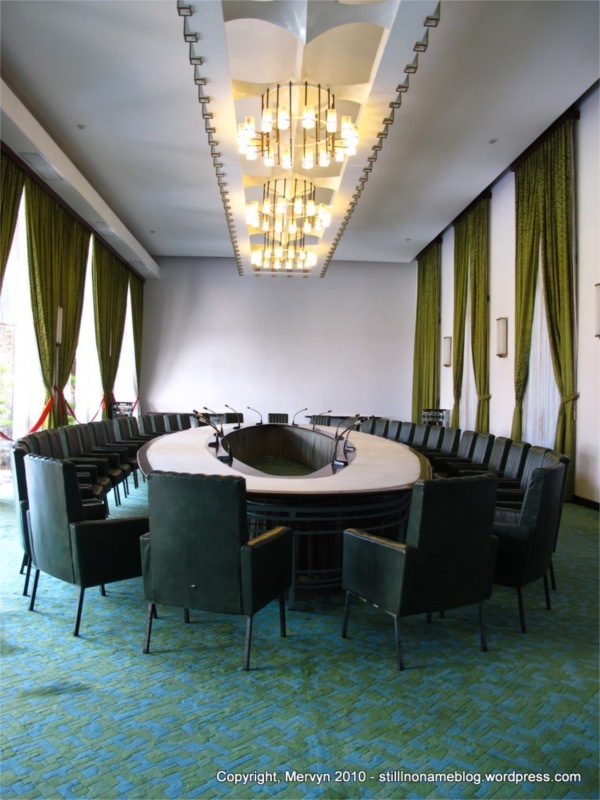 I could actually picture American dignitaries seated around these giant tables, taking in the décor of dirty yellow or military green as they sweated through their suits and ties, their thick, black-rimmed glasses slipping down their perspiration soaked noses. They would have towered over their shorter Asian allies. Lots of smiles, lots of handshaking. An occasional posed picture of the great Americans helping their democracy loving brethren. 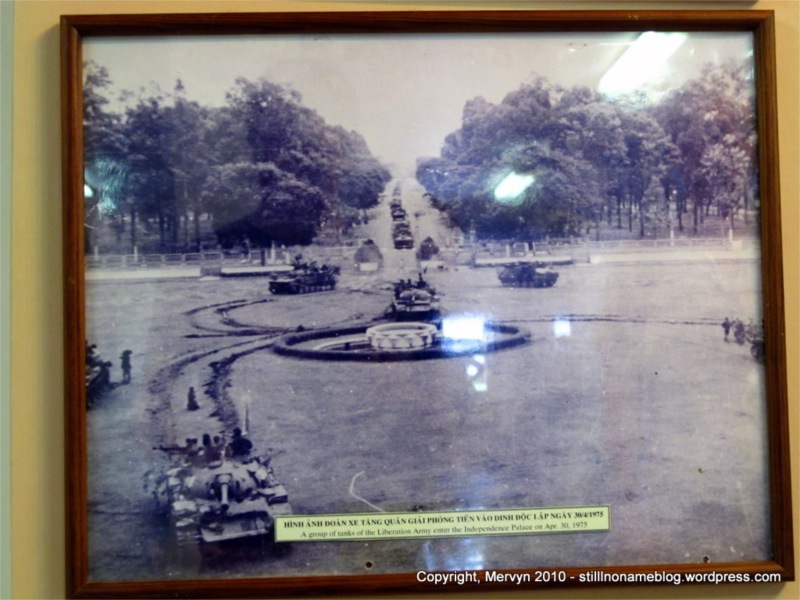 State rooms were filled with all kinds of artifacts showcasing the wealth of the host nation. The same right angles are repeated in the blocky furniture. Like any good Asian nation, there’s a prodigious amount of gold. 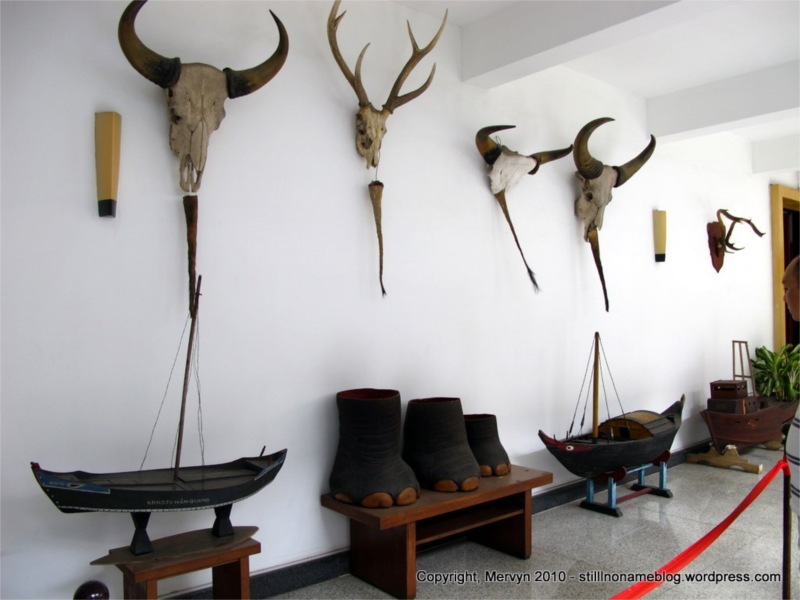 A wall that lined an inner courtyard on the third floor was decorated with what looked like hunting trophies. Skulls of felled wildlife with their dried tails hanging from their mouths. There were even elephant feet, arranged in three different sizes like the three bears. One too big, one too small, one just right. 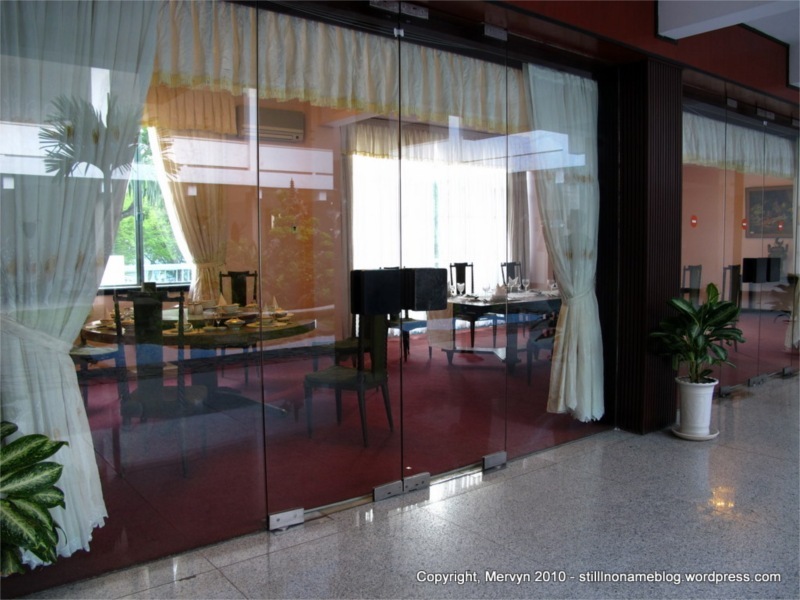 Across the courtyard was a dining area, closed off from the outdoors by glass doors. Each round table had a Lazy Susan. It felt like I’d walked into a neighborhood Chinese restaurant in San Francisco’s Inner Sunset. It made me want to eat dim sum. All the stately stuff was interesting and all, but they just couldn’t hold a candle to two of my favorite features. The first was in the basement. The maze of hallways hid the underground war bunkers. It was old school TV come to life. I kept rounding corners expecting to stumble across Maxwell Smart or, better yet, 99. Turns out the TV show wasn’t kidding about the design tastes of mid-20th century spies. They got a lot more right than I would have ever expected. The hallways were an anonymous grey-white, all polished and echoey. Tiny alcoves would have a metal desk, a telephone, and file cabinets—the sort of place junior spooks went to die. Transistor radios still sat waiting for the next signal. Everywhere there were heavy looking AT&T standard phones on the verge of ringing. Hidden in the maze, was a presidential hideout–a single bed where he could wait out a bomb attack. Next door was an office where he could direct the war if the palace were under assault. Maps lined the wall around a desk with two phones. It didn’t seem like much. Perhaps it was high tech for the time. Perhaps they didn’t have much money. Seems like such a bare, uninteresting, disconnected place to run a war. Walking those halls, there was a clash between the comedy of Maxwell Smart and the serious business that was conducted here. It was a time machine or, perhaps better yet, a time capsule. No one told this place that we’d made it to the next century. Locked away deep underground the war never ended here. Operatives were just around the corner, ready to fire up the radar station and start talking into their telephone shoes. I got the same feeling upstairs in my second favorite spot: the “Gambling Room.” This was straight out Sinatra, Dino, and Sammy Davis, Jr. Washed out oranges and yellows balanced by off-white and dark brown. Plush leather high-backed chairs. A circular leather couch around a low table. You can imagine the Rat Pack dropping in for cigars, booze, girls, and a game of cards. There was even a little bar underneath what looked like poker chips crossed with roulette wheels on the wall. The only thing that gave away the fact that you weren’t in old school Vegas or Beverly Hills was a table set up for mahjong. Maxwell Smart would’ve felt right at home in the Gambling Room, meaning he’d be happy to spill a drink on a dignitary or accidentally light a chair on fire, all to be rescued by 99. I wouldn’t have been surprised if there’d been a secret panel on the wall that opened into a hidden lair. 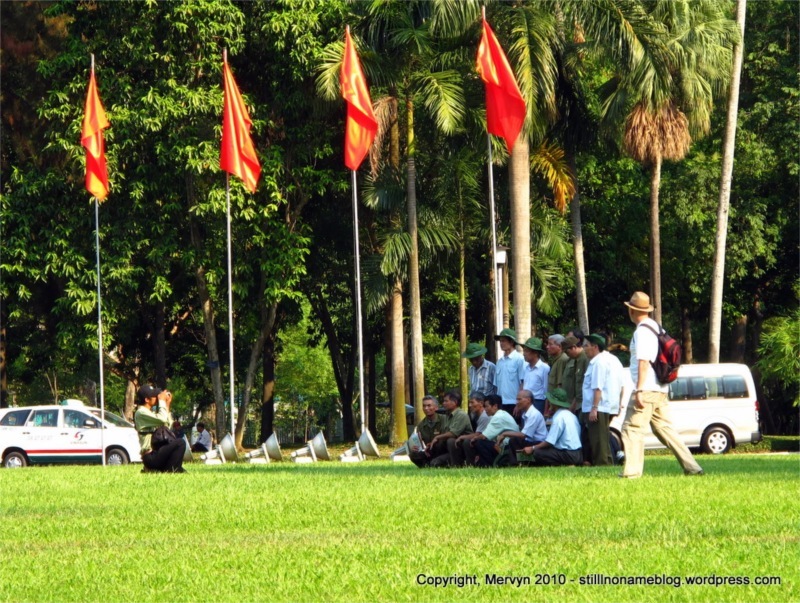 Outside the palace, a group of what looked like Vietnam Vets gathered for a picture. Actually, I should clarify—these were Vietnamese Vietnam Vets. They were older and had green jackets or hats. Perhaps they’d fought to liberate Saigon. I couldn’t tell. I may look Vietnamese, but I sure don’t speak it. The main difference between their American counterparts that I noticed: they do a lot more smiling in pictures. The experience was compelling. It felt like living history, particularly because there’d been no attempt to modernize the place. Unlike the White House, the décor is frozen in time. There are no computers sitting around. The current administration hasn’t added any modern or personal touches. It doesn’t feel like a living, active building. It’s like all the people just up and disappeared one day in the 70’s and the people that followed just decided to occasionally vacuum and dust to keep up appearances. 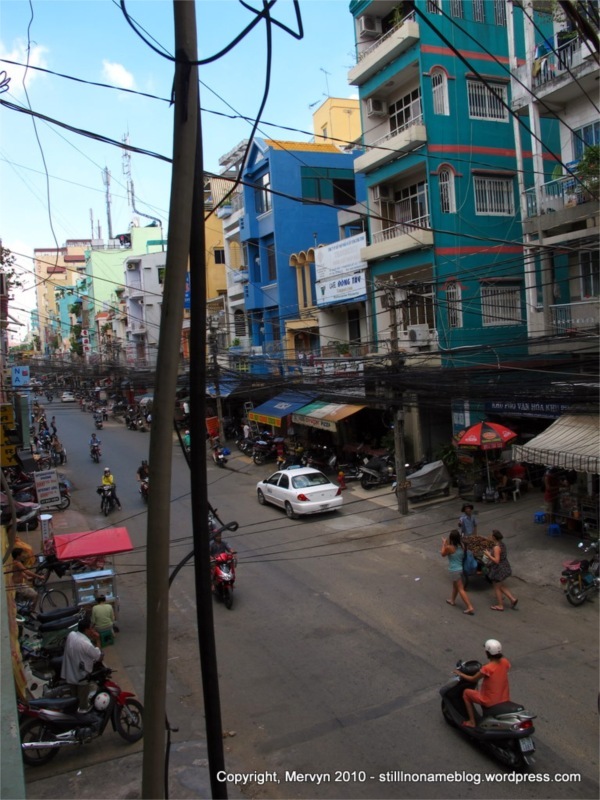 It’s as it was the day Saigon fell. All the communists did was brand it with pictures of Uncle Ho and toss on some red and yellow flags. A time capsule for rent. Guess some things have changed. 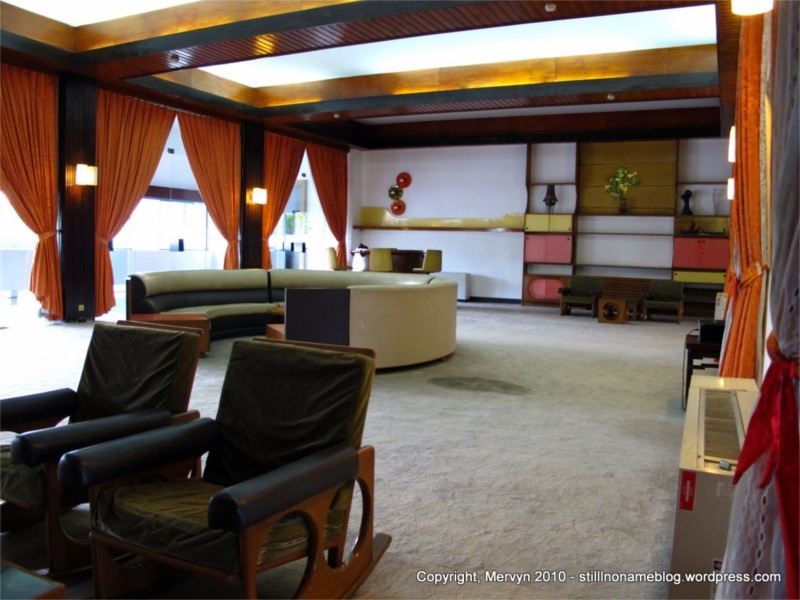 So, to anyone out there that cares, feel free to book the Independence Palace for December 31, 2012 and my “surprise” Get Smart themed 35th birthday party. Do it. You might even present me with my own commemorative shoe phone. And a telephone booth elevator. And a horde of Agent 99 clones acting as cocktail waitresses. Your secret birthday plans are safe with me; I promise not to ruin the surprise.